Immersion Research – Drytops, drysuits, fleece-lined board shorts, rash guards, and even sprayskirts…pretty much everything you need in terms of clothing and neoprene to go rafting or kayaking. Kokatat – PFD’s, drytops, and top-of-the line drysuits are their specialties. Located in Arcata, CA. FNA Helmets – Wide variety of colors and styles, these 80% kevlar helmets can be ordered directly from the company or found at your local kayak shop. Grateful Heads Helmets – Don’t let the colors, glitter, and glitz fool you. These are high-quality, well made helmets – with a bit of flare. Mountain Surf – Spray Skirt manufacturer based out of Ontario. You can often find their sprayskirts at the local river stores. 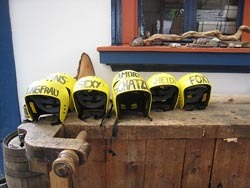 Shread Ready Helmets – Well-made kayaking and rafting helmets. Snapdragon – Spray skirt manufacturer from Seattle, WA. They offer a wide range of skirts, including some highly reinforced whitewater decks. Stohlquist – Drytops, pants, and drysuits, PFDs, sprayskirts. Based in both WA and CO, these guys have been making paddling gear for over 30 years. Whitewater Research and Safety Institute (WRSI) – Inexpensive, well made helmets. Plastic based, with good protection coverage. Shoes that will stay on your feet are required on most commercial rafting trips and recommended to anyone braving whitewater rapids. The obvious reason is that they protect your feet; additionally we prefer to keep the river canyons from being littered with runaway flip flops. An old pair of running shoes usually does the trick, however, if you want to get fancy, here are a few companies that can provide you with great water sandals. Chaco: A favorite amongst river guides and outdoor enthusiasts, a Chaco foot tan has become a status symbol in the river community. Keen: Protect your toes! Although their sandals are a bit goofy looking, they are quite comfortable and will keep your toes protected from rocks. They also make a very nice kayaking booty that will fit in your boat. Teva: An old-time river shoe manufacturer, they have everything from water sandals to kayaking booties. Take your pick! Be wary of online outdoor stores that sell paddling gear – it is often for sea kayaking, or kayak touring, and not for whitewater. A good comparison is imagining taking cross country ski gear to a ski resort or trying to run black diamond chutes. Yes, the pfd’s will still float you, but sea kayaking gear is designed for less turbulent waters. The five essentials: Kayak, paddles, sprayskirt, helmet, and pfd should be whitewater specific. However, water shoes, poly pro tops, float bags, throw ropes, and carabiners can be bought at the REI closest to you! Lots of good deals, but it can be hit or miss. Make sure if you’re buying technical kayaking gear that it’s whitewater specific. Man of Rubber: Loads of rafting and kayaking equipment. They specialize in mesh and rubber bags and boat repair stuff. REI: Great for long underware layers, drytops and drypants, throw ropes, etc. The range of equipment seems to vary from store to store. The River Store: The local kayak shop in Coloma has a wide variety of kayaking and rafting gear. Sierra Outdoor Center: Located in Auburn, you can find just about everything new and used from rafts and kayaks to throw ropes and float bags.